Forget about trading Rajon Rondo, or how ready Marcus Smart is for the NBA, or whether Jared Sullinger should be spending so much time hanging out at the three-point line. The biggest issue for the Celtics moving forward is getting a legit big man who can defend the post, protect the rim, score around the basket and play 33-38 minutes per night. This isn’t exactly breaking news but look at it this way: If the Celtics don’t get that guy, somehow, whether it’s via trade, free agency or even in the draft, they might wind up losing Kelly Olynyk. To clarify, they would be losing him in the figurative sense. It’s already happening. And even though the Celts have won two in a row (should’ve been three if not for blowing a 23-point lead against the Hawks on Tuesday), it’s tough to miss what a toll their current plight is taking on the 23-year old seven-footer from Toronto. Here’s the thing about Olynyk: He’s a really nice player, a unique talent with a multi-faceted game. Guys his height who can shoot, pass and handle the ball like he can aren’t terribly easy to find. Under the proper circumstances, he has the skills and the upside to develop into a valuable, versatile weapon for a team with a creative, potent offensive system. Think Dallas or Portland or even Charlotte, which has been lost this year without Josh McRoberts, another non-traditional big man with a similar skill set as Olynyk. Instead, because of the personnel deficiencies facing the Celtics, Olynyk has to play the 5. He may be seven feet tall, but he is not an NBA center. And it’s wearing on him in a big way. After averaging 14.4 points per game through the Celts’ first eight games, Olynyk has cratered, putting up just over seven per game in their last nine with a couple of donuts sprinkled in there. He recently went through a four-game stretch in which he shot a mind-boggling 3-for-21 from the floor. His playing time has decreased significantly (he hasn’t topped 27 minutes since Nov. 4, after playing 29 or more in six of the Celtics’ first nine games), he’s been replaced by Tyler Zeller in the starting lineup and has been straight benched on more than one occasion. But none of this – not the reduction in minutes or points scored – has anything to do with offense. It’s the other end of the court that’s slowing Olynyk down. He works hard but no amount of preparation can make up for the fact that he’s simply not equipped physically to deal with the rigors of being a traditional NBA big man on defense. It’s probably not a coincidence that those four games in which he could barely buy a hoop came against Portland, Chicago, San Antonio and Atlanta, all teams with big, strong, athletic bigs. Olynyk has real problems handling that kind of opponent on defense. He’s even had issues with end of the bench guys like the Spurs’ Jeff Ayres (see above) and the Grizzlies’ Jon Leuer. The advanced numbers, from his player efficiency rating to his defensive rating to his defensive win shares, all put him around league average levels. He piles up fouls, making it difficult for him to get into any kind of rhythm. He’s just not strong or quick or big enough regardless of his height. And when you struggle as badly as he has of late, your confidence takes a direct hit. Suddenly, you’re tentative on offense. Shots you’re completely comfortable taking look and feel tougher. Instead of catching a pass from Rondo that finds you in the exact, right spot and going up with it, you hesitate, the defense rotates to you and you’re no longer open. And you either miss a shot you normally drill with your eyes closed or just pass on it altogether. The next thing you know, you’re 3-for-21 over four games and spending time on the bench that you’re used to spending on the floor. And when you are on the floor, you look unsure of both yourself and your teammates. You can’t break free and just play your game. This is the dilemma facing both Olynyk and the Celts right now. Things looked like they may have taken a turn for the better in Wednesday night’s win over the Pistons. He shot 8-for-13 from the floor in 27 minutes, scored 20 points, grabbed seven rebounds, hit a couple of threes and hung in there on defense despite the presence of Detroit’s twin behemoths Greg Monroe and Andre Drummond. And while he didn’t do much against the Lakers on Friday night, that was more a function of Zeller’s career night than ineffectiveness. But Olynyk isn’t going to bulk up into someone who can handle most regular, current NBA big men. He is what he is. And the Celtics can’t hide him. Zeller, who also isn’t on the same level as some of the bigs who have been feasting on the Celtics all season, is still a little bigger and a little stronger. Sullinger is undersized as a power forward let alone at center despite his ample width. And Brandon Bass is six-foot-six. Maybe Celtics’ coach Brad Stevens could try playing Olynyk and Zeller together more, with Zeller staying in the paint and Olynyk playing stretch-4, taking his man out to the perimeter and beating him off the dribble (he has a very quick first step for a big guy) and running him around screen so he can get open for jumpers. But that would take time away from Sullinger, who is developing nicely into a solid, valuable player. He’s got to be out there. So Olynyk and the Celtics are stuck. The fact that Zeller is playing well and has developed an obvious rapport with Rondo – particularly on the pick and roll – makes it easier for Stevens to play him ahead of Olynyk. 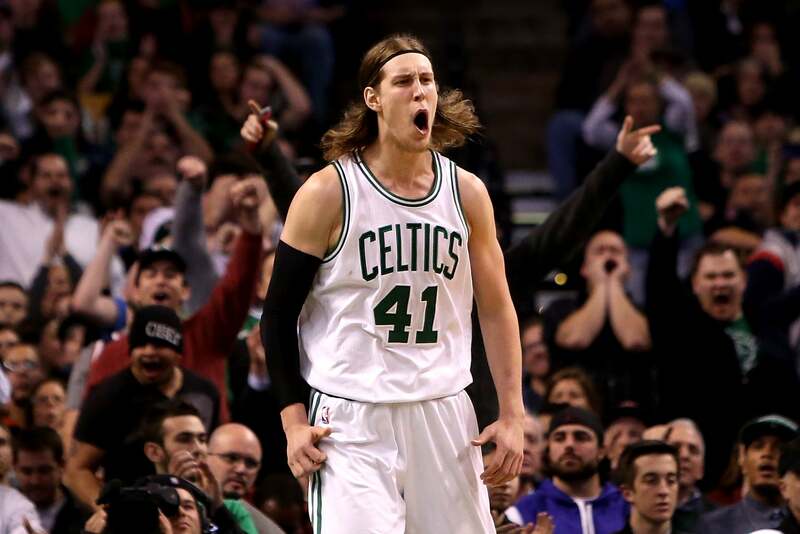 But what will that ultimately do to Olynyk’s already wavering confidence? And if the Celtics decide somewhere down the road that they want to try to move Olynyk along with some of their truckload of draft picks in exchange for a star player, won’t that be much more difficult to do if Olynyk has turned into a puddle? The answer is yes. And it feels like one of a few certainties these days when it comes to Kelly Olynyk and the Celtics.